There are many kinds of viruses that can infect a wide variety of plants all over North America, including beans, celery, corn, cucurbits, peas, peppers, spinach, and tomatoes. Symptoms vary with the specific virus, but include mottling, streaking, puckering, or curling of leaves. 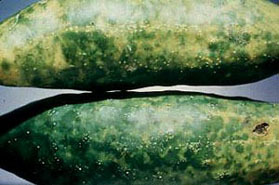 An example is cucumber mosaic virus, which infects cucurbits, tomatoes and peppers, causing green and yellow mottling of leaves, curled leaves, stunted plants, and fruits with light splotches and warty bumps on them. Many viruses are spread from plant to plant by sucking insects, such as aphids and leafhoppers, as they feed. Follow these links for additional photos of tomatoes infected with Tobacco Mosaic Virus and Cucumber Mosaic Virus. Consult your county Extension Service for help with a specific diagnosis. Control insects that spread disease. Pull up and burn infected plants. Choose resistant varieties when available. Buy certified virus-free seed potatoes. Control weeds that harbor viruses.